Whether you’re hosting a Halloween party or creating homemade gifts for teachers, here are some of our favorite Halloween food ideas. Halloween is just around the corner! Are you ready? We’ve rounded up Halloween-themed truffles, cake pops, cookies and cupcakes as well as fruit and veggies (and rice balls!) that look like ghosts, pumpkins and mummies. Monsters, witches, skeletons and bats also all show up for the party. Click on each link for recipes and instructions for the most ghoulish of treats, just perfect for decorating your Halloween season dessert table. These 13 Savory Pumpkin Recipes cannot be missed! Check out these 25 Spooktacular DIY Halloween Wreaths! Take a peek at these 22 Amazing Halloween Cupcakes — yum! A Halloween recipe inspired by everyone’s fall favorite—pumpkin spice—is definitely a great dessert choice for a Halloween party. These delicious butterscotch pumpkin cake truffles are already party pretty, but reverse the icing colors and add a pretzel stem to morph them into little pumpkins, and they become especially perfect for their Halloween party debut. Edible brains are the perfect creepy Halloween party food! Making these chocolate brains couldn’t be easier! You’ll need a great quality chocolate, and a brain ice cube or chocolate mold! Add them to your Halloween dessert table, and watch guests go mad over them! Create this army of no-bake ghost cake pops (or ghost cake truffle balls) for your next Halloween party without any fear or trepidation! No cake pop sticks are involved, which removes most of the fear of messing up the dipping process! Feature the Bride of Frankenstein, Frankenstein, the Wolf Man, and Dracula in edible form on your Halloween dessert table. You’ll use colored ice cream cones to make these special monster faced treats. You actually bake the cupcakes right in the cone using these step-by-step instructions. In addition to a cake mix and the colored cones, you’ll need: chocolate and white frosting, edible eye candies, red frosting, green jelly beans, and assorted candies and sprinkles. Give a quick little edible costume coating to your strawberries this Halloween! Using white Candiquick, you can dip strawberries to look like Halloween ghosts! Add a pair of mini chocolate chip ghosts, and you’ve got an adorable Halloween party treat! Display them in mounds of crushed Oreo dirt for a clever “ghosts in the graveyard” dessert display. You are only 3 supplies away from this genius Halloween party treat idea! Grab glazed ring donuts, plastic vampire teeth (enough for one set of teeth per donut) and chocolate chips for eyes (one pair per donut). In two quick steps you’ll be serving up monster donuts! You’ll never look at a doughnut in the same way again. Hearing “Go eat a bug,” wouldn’t be so bad if it was one like this savory appetizer. Serve up bugs at your next Halloween party to give your food a creepy twist. These bug crackers are an easily assembled appetizer using round crackers, olives (head), chives, (antennae), quartered cherry tomatoes (wings), and a seasoned cream cheese mixture. Halloween is a holiday filled with loads of sweets and treats. This idea for clementine pumpkins is adorable, and provides an idea for healthy Halloween party food! You’ll not only love how cute they are, but also how easy they are to make! After peeling each clementine (substitute small oranges if that is all you have), simply insert a one inch piece of celery into the top to create a pumpkin stem. Creative Halloween party food isn’t just about the food. Sometimes it is about the presentation. Don’t overlook the display power of your pumpkins! Mr. Pumpkin is not just a pretty face-he’s a useful serving dish too! Can your guests stomach this mac ‘n cheese display? Hot dog! These crescent mummy dogs make a great addition to your Halloween party menu. Preparation is easy! Cut strips out of store bought crescent roll dough and mummy wrap your favorite brand of hot dogs in the crescent roll strips prior to baking. Add freaky mustard eyes to scare up some screams at dinner. Turn those leftover pears into a spooky Halloween treat! You’ll give the pears a little white chocolate bath until coated. Then add dark chocolate chips for eyes. Insert a Popsicle stick and you’ve got one yummy pear ghost for your Halloween party. Duplicate for the number of Halloween party guests on your list, and you’ll have a spooky treat that guests will be excited to try. All the classic movie monsters join for this vintage horror movie monster mash bash! Dracula, Frankenstein, the Wolfman, and even The Creature from the Black Lagoon are included. 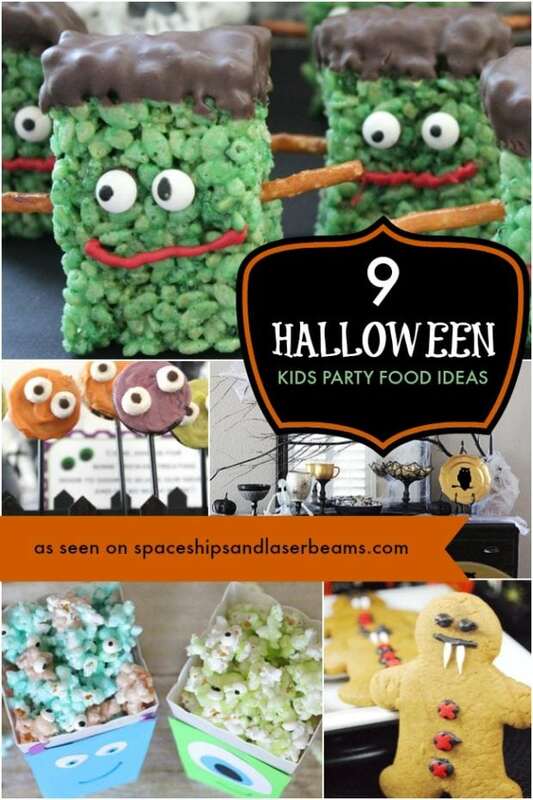 From monster printables, to terrifying treats like jelly eyeball and gummy worm topped cupcakes and impaled apples, this dessert table is staged to frighten. Rest easy; your guests will love Tombstone Cookies and Dark Chocolate Graveyard Pots de Crème. Try your hand at DIY ghost fruits, peanut butter popcorn, or chocolate apricots. If you’re a Halloween fanatic, make an entire Halloween dinner with inspiration from this post! Two favorites collide –cheesecake and candy corn—to create one awesome Halloween inspired treat—candy corn cheesecake! This recipe utilizes a checkerboard cake pan which allows 3 different colors of batter to bake all at once! Treat your Halloween party guests to this rich tasting cheesecake! The only bone Halloween party guests will have to pick with you will be about not sharing the recipe for these skeleton cupcakes with them sooner. 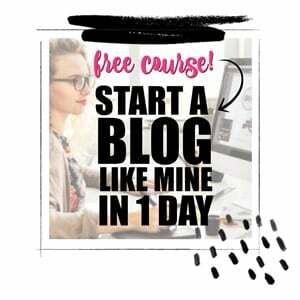 You’ll start with some basic white frosted cupcakes. Add sprinkles if you wish. Next, be sure you have these supplies on hand to create your edible skeleton toppers and follow the simple assembly instructions: white chocolate covered pretzels, large marshmallows, lollipop sticks, food writer (or black icing). These perfect no-bake witch hats are cute and easy to make. Gather your little boo crew and get an assembly line going. Kids will love helping you prep these marshmallow witches for a Halloween party treat or a great gift! You can whip up a batch of a dozen in about 30 minutes. Here’s a great way to serve veggies for your Halloween party. A little creativity turns carrots, cucumbers, broccoli, and veggie dip into a pumpkin shaped veggie tray masterpiece. The carrots are used to create the pumpkin shape with a cucumber smile and ramekins filled with dip as the eyes and nose. The pumpkin is topped off with a broccoli stem. An everyday sandwich shows up at the party, looking like death warmed over. No special skills are required to recreate this scary skull sandwich. Imagine a whole platter of these spooky sandwiches served up on a platter for your Halloween party! Be prepared for these Halloween spider cupcakes to creep and crawl right of your Halloween party table and on to guests’ dessert plates. Because of how easy these cupcakes are to make, you can even have kids help with this Halloween treat. You’ll need basic cupcake and glaze ingredients, plus chocolate sprinkles, candy eyes, and black licorice laces. 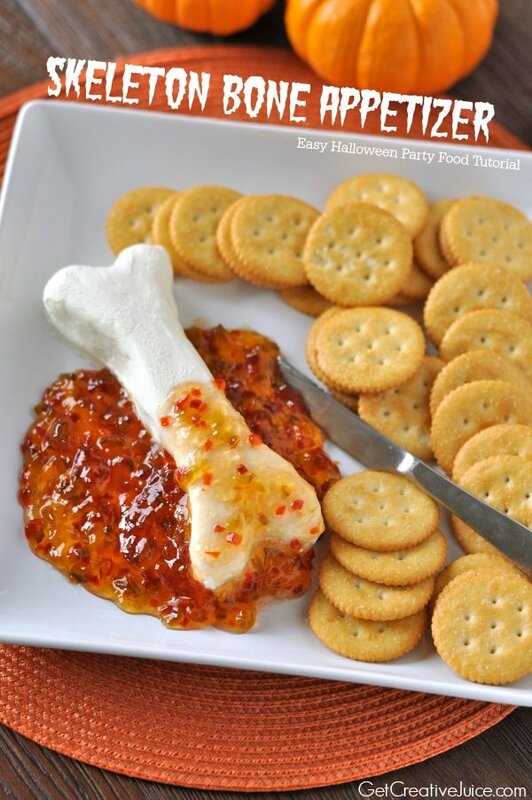 This cream cheese and pepper jelly dip skeleton bone Halloween appetizer is about to become your go-to dish to serve at or take to your next Halloween party (or should be). You’ll only need to pick up 3 items—a block of cream cheese (to form into a bone shape), pepper jelly dip (to pour on top of the bone to look like blood/guts), and crackers! “Bone appetite”! Get creative with your Halloween appetizer! This Halloween mummy spinach dip idea is a creative appetizer and sure to be a great Halloween party crowd-pleaser! If you love to bake, this Halloween chocolate cake recipe is for you. It’s sure to be the star of your dessert table! Four layers of chocolate cake dripping with frosting sounds pretty amazing, doesn’t it? Plus, the addition of chocolate eyeballs and plastic spiders really drives home the spooky Halloween look. Get creative with this year’s Halloween cupcakes! It’s easy to decorate adorable owl, mummy, and tombstone cupcakes, especially with these tips and tricks. Guests will feel treated your creativity and culinary skills. Spend an afternoon looking for new ways to use holiday cookie cutters and you might have come up with this idea for chocolate pumpkin Halloween cookies all by yourself. This idea takes a gingerbread man cookie cutter + this yummy chocolate pumpkin recipe and you’ll have yourself some mummy cookies to serve up come Halloween. Whether you make them silly or spooky faced, you must make these skeleton cupcakes this Halloween. This festive Halloween party food idea pairs made-from-scratch mini cupcakes with big cupcakes. To create the skeleton and his face, you’ll need white jelly beans, brown M&Ms, chocolate wafer cookies, and strands of black licorice. Or, feel free to get creative and use other edible embellishments to create your skeleton’s face. Festive Halloween food isn’t limited to just the dessert table! Serve up a side of pumpkin rice balls with your favorite entrée! Orange colored rice shaped like a pumpkin is perfect for a Halloween dinner party. A Halloween party is the perfect place for showing off these spooky Frankenstein cupcakes. Green frosting creates Frankie’s face, and sprinkles are the perfect edible hair. Follow the photos and text tips for adding the eyes and bolts which make Frankenstein really come to life! Easy to put together and super cute? Sounds like a winning Halloween party food idea to me. Create these pumpkin fruit cups for your upcoming Halloween party! You’ll need a permanent black marker to draw jack-o-lantern faces to the front of your fruit cups. Finish the pumpkin fruit cups by embellishing them with dressy witch hats. This makes a great healthy option for your Halloween party refreshment table. Party guests will die over the creativity behind these zombie marshmallows. You’ll die over how easy they are to make. You’ll need: marshmallows, light corn syrup, large confetti sprinkles, black and red food coloring pens, and a toothpick! Prepare for amazement from your Halloween party guests. Add something adorably sweet to your Halloween plans this year! These bat Oreo truffles make a great handmade dessert for a Halloween party table or a fabulous gift for teachers, friends and neighbors. This is a no-bake dessert, and only seven materials are needed: chocolate, Oreos, cream cheese, edible eyes, mini chocolate chips, wax paper, and a Ziploc bag. Now here’s a treat your Halloween party guests will be excited to sink their teeth into—vampire caramel apples! These caramel apples get scary with the addition of marshmallow fangs. Follow these tips and tricks for making a quintessential fall treat favorite—a perfect addition to any Halloween party dessert table. Warm up your Halloween party guests with a warm mug of Halloween hot chocolate. This takes a great warm autumn beverage and gives it a creative Halloween twist. This recipe features white hot chocolate that is transformed into a hauntingly hot Halloween beverage using a little food coloring and edible googly eyes.